Stinkhorns. Truly they are the Devil's own. Every single one of them has its own, unique form of demonic architecture as infernal angles, malevolent tentacles and diabolical columns conspire to pepper the world with visions of damnation. A lot of them look just like a... thing. They are incredibly phallic, to the extent that the 80 species of Stinkhorn are all in a family called Phallaceae. Then there's the "Stinkhorn" thing, because these barbarities assault not just the eyes, but the nose too. They stink! 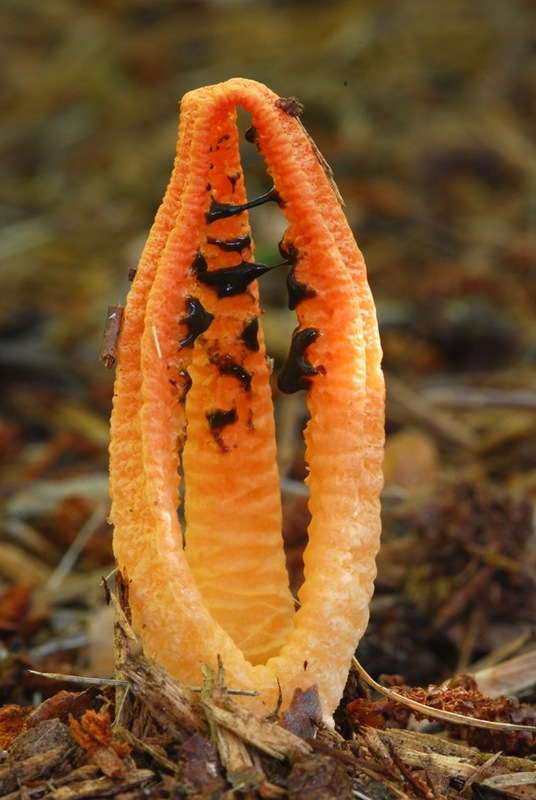 Stinkhorns produce a sticky mass called the gleba, which stinks of carrion, faeces, sewage, and various mixtures of corruption and death. It is in this malodorous ooze that their tiny spores throb with malicious possibility. Flies, many of whom are at the forefront of the filth subculture, are attracted to such nastiness. Clambering all over the stench, the spores stick to their feet and are carried far and wide to burgeon into malicious actuality. So hold your nose, think happy thoughts and bring a barrel of air freshener. We are off to the bowels of Hell. And it'll smell like it, too. It must be a bit of a shock to stumble across an Anemone Stinkhorn. 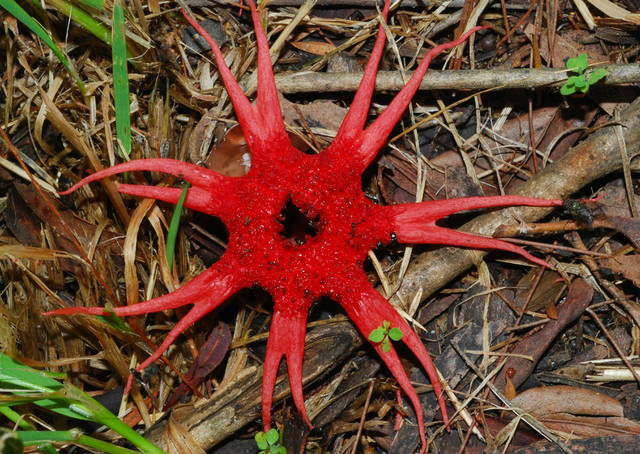 They are most commonly found in Australia and were apparently the very first mushrooms from that land to be scientifically described. This is not a pleasant introduction. No wonder we turned it into a giant prison colony like they did to New York that time! Anemone Stinkhorns reach about 10 cm (4 in) tall and have a certain variety in form. Usually it's clear they have 6 to 10 arms each divided into 2 tentacles. Sometimes it's not so clear, and they end up looking like the corrupted soul of a sunflower gone bad. 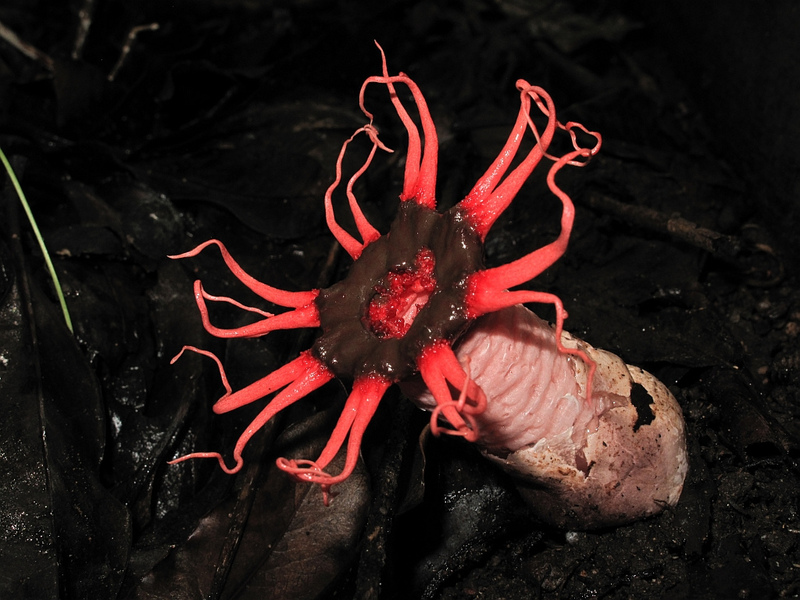 The gleba is thickly smeared in a ring at the base of the tentacles and all stand atop a disturbingly fleshy, pink and hollow stalk. Together with the mockingly vibrant, red colour, we have everything we need to give it the scientific name Aseroë rubra. 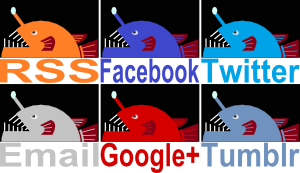 It comes from the Ancient Greek words for "disgust", "juice" and "red". I can't help but imagine a poor nature lover studying this thing and being driven mad by knowledge not meant for mere mortals. Running around screaming "Disgust! Juice! Red! Disgust! Juice! Red!" And then one of his colleagues saying "I think he wants us to call it Aseroë rubra". I wonder what he found out. Perhaps it ties in with the fact that the Anemone Stinkhorn has now spread to parts of Europe and America. Some say the spores were spread via the sale and trade of plants. Others say this doesn't explain how it could reach isolated Pacific islands. I say... "Disgust. Juice. Red." Again with the great, big stalk, but this time topped with a latticework akin to a tiny Red Cage Fungus. This is covered in depressions that are full of the sticky, dark olive gleba that brings all the flies to the yard. 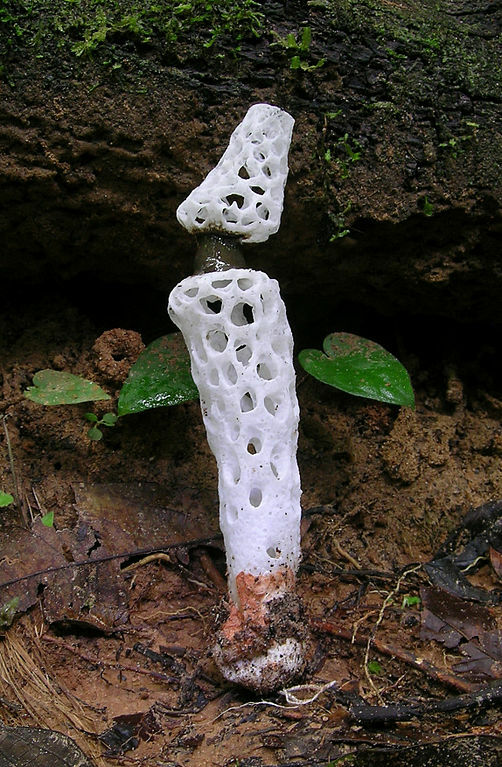 The Stalked Lattice Stinkhorn can reach 15 cm (6 in) long and is found all over the tropics, from Africa to Asia to the Americas. It's strange, usually when zombies come to life it's their hand which first erupts from the grave. Don't worry, the trusty shotgun method still works. We all love explosions, right? Big, beautiful kaboomies viewed in slow motion from multiple angles over and over again. From cavemen sitting round watching the campfire, to cavemen sitting round watching massive campfires on the telly. It's called progress! Well, if you got a tiny bomb and set it off in the middle of the Stalked Lattice Stinkhorn's stalk, you would be left with something like C. hirudinosus. It's even explosion-coloured! These are found in parts of Europe and Asia as well as a couple countries in Africa. They've also been spotted in Australia and Jamaica. Slowly, slowly their territory expands. Most lanterns spread light in the darkness, chasing away fears, bringing levity to heavy hearts and offering sanctuary to travellers. This one spreads the stench of sewage. Not only that, but it looks horribly sharp. Phallic and sharp. It looks like a self help device John Harvey Kellogg would be proud of. 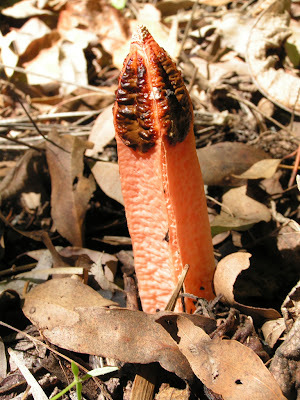 The Lantern Stinkhorn comes from Australasia and the Far East. It was first seen in Europe in 1979 and can also be found in parts of the United States. It may well be the case that our own activity is spreading these mushrooms all over the place. But what does it say when we do the job even better than those obnoxious flies? At least they find the sick fruits of their endeavours flavoursome. What happens when you take one of those phallic Stinkhorns and cut it from top to bottom? Aside from guys covering their nethers like it's a free kick, you get the Stinky Squid. 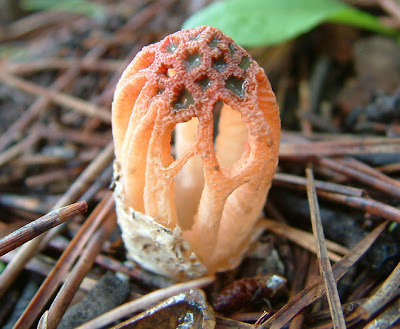 This mushroom from Australia, Japan and southeast Asia reaches up to 6 cm (2.4 in) in height and has 3 or 4 columns that all meet up at the top. With its warm, glowing orange and yellow colours it looks like a solitary flame frozen on the forest floor. This is probably the kind of thing you get in Hell's VIP lounge. It's just a shame that the gleba on the inner surface makes it smell like manure. This is another Stinkhorn on the march. It was first observed in the US in 1915 and has since spread all over that country, including Hawai'i. This time we get one of those phallic Stinkhorns and cut it from the top to about halfway down. Carefully unfurling the sliced sections apart we are left with a lovely little flower. 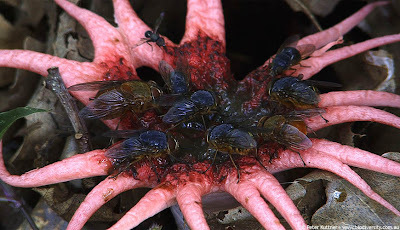 Each 3 to 10 cm (1.2 to 4 in) long petal is a rich, pinkish-red colour and covered in fetid muck to attract flies. Starting out in Australia and New Zealand, it has since spread to Asia, Europe and North America. What's up with Australia and New Zealand? 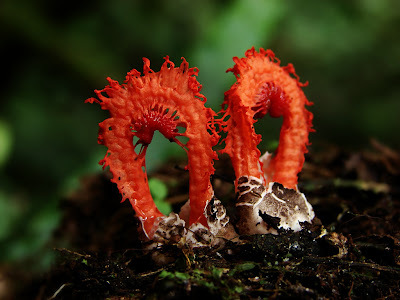 I'm starting to think that all those horrifically venomous snakes and spiders and jellyfish are a direct result of the maleficent presence of these abominable mushrooms. They're turning the whole world against us! If Heaven has the Pearly Gates, then surely Hell has something like this. It still has that filthy gleba stinking up the place, but this time it's suspended on the underside of an archway. If it really was a door, it's right where your head would go. The punishments start early in Hell. Unfortunately, they only reach about 6 cm (2.4 in) in height so wicked witches can't even use them as a fancy mirror frame to get all angry when Snow White shows up in the middle of it. Even worse, with all these horrible mushrooms showing up all over the world and slowly conquering us all, this one is found only in Central America, northern South America and the Caribbean. They live in forests several thousand feet up mountains. They think they're too good for us! Hmm... I guess it is a really fancy mirror frame... and it'd just get caked in dust for years round my place... You win this round, mushroom! After all that flesh and fire, I thought it would be nice to end with a hole-y ghost. S. cinctus is another one from Central America and northern South America and it looks amazing! 15 cm (6 in) tall, white, spongy and full of holes. There's nothing quite like it! A little below the top is a constricted area where, I'm afraid, the gleba lurks. This mushroom stinks just as much as all the others and it attracts... Stingless Bees! I have no doubt that a whole host of flies also pop in for a visit, but certain bees have been seen grabbing bits of gleba, packing it into their pollen baskets and carrying it away. 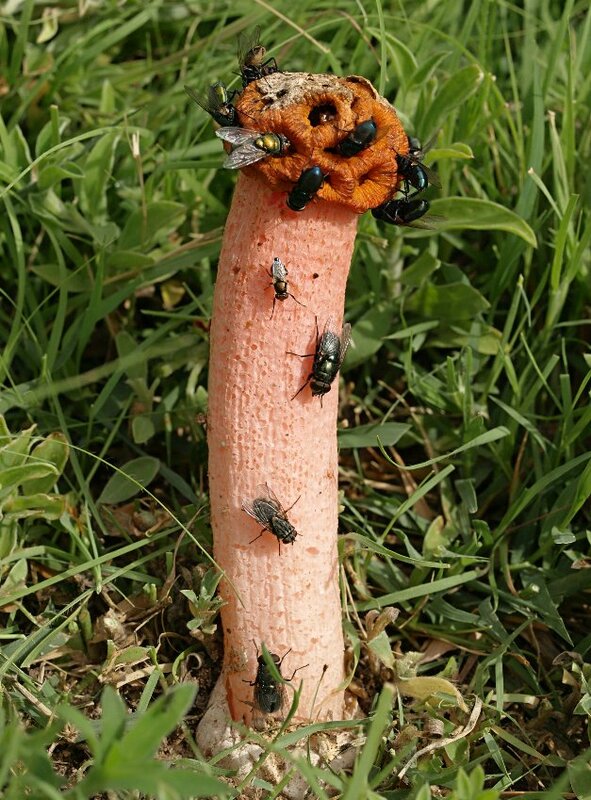 It's probably used for food or building material and who knows whether it's a good thing for spreading spores, but it's still nice to see a Stinkhorn having a go at being slightly less disgusting than usual. 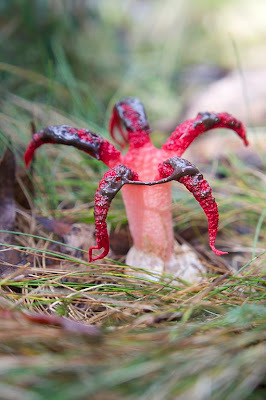 If a Stinkhorn can do it then so can we all. There's your moral for today: try to be slightly less disgusting than usual. Eugh... Nothing like a swarm of flies to make a fungus look just awful. Have you ever covered Cedar Apple Rust? @TexWisGirl: I think they'd fit it in better there. They stick out like a sore thumb here! @Crunchy: Swarms of flies are really good at making things look awful, it's one of their main abilities. Eek Gad! I'd never seen Cedar Apple Rust before! Looks horrible! I kind of like them! They're so alien. Every other year, whenever it rains the big lovely juniper trees in front of my house are covered in globular orange fraggles. I mean, I'm not crazy that they're killing my junipers and my cherry trees, but as far as fungal infections go it's fun to look at. @FaustXIII: Ha! Yeh, always avoid the shitpaste! Use honey or something instead. Stopping spores from getting around really is a mammoth task. I've no idea what anyone does to stop mushrooms from growing outdoors. Good luck! My husband had 4 humongous trees removed from our property and ever since then, we have been getting these unsightly and gross stinkhorns. Had a tree guy come out and he said they were feeding off the rotting roots where the trees were removed. Told us to dig up the roots! What??? Too big of a job.